With fields of cars on the TV and everyone wondering who is going to make spare parts for them, Rovers were rock bottom today. The 116k mile 02 reg 75 Club SE Touring was nevertheless a CDT auto in unmarked Wedgwood blue but could not command a bid over £4,225. 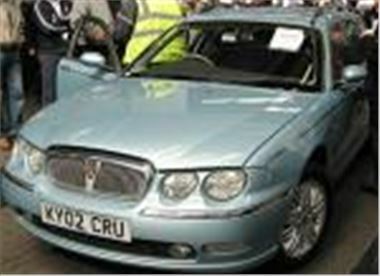 A Gold ex-Motability 26k mile 02 reg 75 1.8 Connoisseur auto (smallest engine, highest spec) sold for £5,500. A 61k mile Y reg 45 1.8 Classic sold for £1,975, a 63k mile 02 reg 1.8 Classic inconsistently bid to just £2k provisional, a 39k Y reg 45 1.6 Classic sold for £2,400, a 76k mile 02 reg 45 1.8 Stepspeed sold for £2,850, and a 37k mile 2001/51 25 1.4iL 84ps 5-door bid to £2,325. And MG ZR 160ps VVCs seem to be everywhere. I saw four in my hometown this evening and at the auction a 24k 03 bid to £5,150 while a nearly new 5k-mile latest facelift 2004/54 bid to £7,800. However, word on the street is that MGTFs went as low as they could go last week and have now bounced back with the Spring sunshine as they always do, so aren’t likely to be as cheap again, particularly now there’s an offer in to maintain production. Ford TDCIs were good value today. An otherwise clean 95k mile 02 reg Focus TDCI Ghia sold for £4,800, a 51k mile 02 reg Mondeo TDCI 130 sold for £5,350 while a 33k miler bid to £5,500. Amongst the special interest stuff, a 113k mile 98S Mercedes AMG E55 estate sold for £10,800, a 102k mile 03 reg BMW 540iSE Touring auto sold for £11,000, a 64k mile 99T Peugeot 406 3.0V6 manual coupe with working aftermarket satnav sold for £3,925 and an apparently damage repaired (but very well repaired) 17k mile 04 reg BMW 645CI on 19” runflats bid to a very solid £37,800. There’s 40-car sale by Honda UK next Wednesday 18th May. Next Top Car sale is at Blackbushe on Monday 23rd May. For Top Car sales at Blackbushe, Measham, Brighouse, and Nottingham, phone 0845 702 3366 or link to www.bca-europe.com/prestige Remember, Top Car sales now include sections direct from Black Horse Finance, Bank of Scotland, Porsche retail and BMW Group. The delayed Ford ex-rental sale is now scheduled for Tuesday 24th May.